If you are looking for visual evidence that a tornado is developing, you should search for clear slot clouds. What are clear slot clouds and what role do they play in tornadic development? Read on to learn more. Clear slot clouds refer to the bright clear sky on the backside of the main supercell thunderstorm updraft. It is distinguished by a reduced cloudiness or clear skies on the west or southwest portion of wall clouds underneath a supercell thunderstorm. 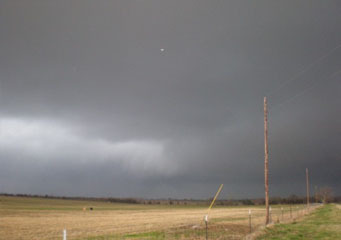 Clear slot cloud is the visual sign of the presence of rear flank downdraft. But what is a rear flank downdraft? Rear flank downdraft or RFD refers to the area of subsiding air flow on the backside of a supercell thunderstorm and plays a vital role in the generation of tornadoes. At What Height are Clear Slot Clouds Found? A clear slot cloud is found at mid-level atmosphere about 20,000 feet above the Earth’s surface. Tornado circulation also develops in the same altitude where the mesocyclone (an air column with strong cyclonic rotation) and thunderstorm updraft are very strong. With a rapidly sinking barometric pressure close to the Earth’s surface, the tornado circulation and clear slot cloud will eventually reach the ground in a matter of few minutes. What do Clear Slot Clouds Look Like? Clear slot clouds appear as bright and cloud-free gap scoured in rain-free base. They are the bright slots visible on the backside of a wall cloud and may appear like curtains of rain covering the cloud base rotation. Clear slot is the mark searched for by storm chasers as the foundation of tornado development. How is Clear Slot Clouds Formed? While most RFD sinks to a lower atmospheric level because the air in it is quite heavier than the surrounding air as a result of evaporative cooling, the RFD that aids in tornado development is relatively special. This is because the RFD is pushed downward due to the divergence of vertical pressure, inducing inward rotation of RFD into the center of the thunderstorm’s main updraft. And because the sinking air is dry and warm, the clear slot cloud is formed. How common is Clear Slot Cloud? This cloud formation is common in Central Plains in the United States where tornado formation is frequent. These places are found in the Tornado Alley which includes Kansas, Nebraska, Oklahoma and Texas wherein 75% of tornadoes happening all over the world occur in these places. This is because the Central Plains in America has all the necessary parameters for tornado development. On the other hand, clear slot clouds are also seen in other parts of the world except in Antarctica. More than just a beautiful manifestation of Mother Earth’s power, a clear slot cloud signifies that it is time for you to take cover as a tornado is developing.